The sheer size of the Philippines (it has over 7,000 islands) and its amazing diversity, with environments that range from stunning submarine coral reefs to rugged and overly-active volcanoes, with beaches, lakes, rivers and forests in between, plus lively modern cities with heritage Spanish buildings, make it a challenge for the visitor to know where to start. 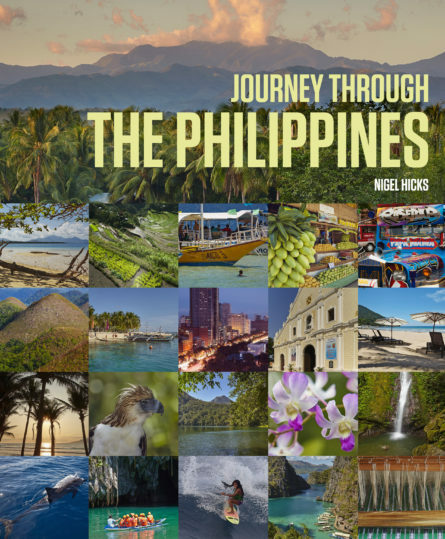 In Journey Through the Philippines, Nigel Hicks presents an ideal itinerary through 30 locations across the country running roughly north to south. Some of the country’s most famous locations are included, not only Manila and Cebu City of course, but also the island resort of Boracay, the famous rice terraces of Banaue and the mountain capital that is Baguio. Other locations are only lightly visited, places such as the beaches of Pagudpud, Baler and Siquijor, the mountain retreat of Sagada, and the volcanoes of southern Bicol. What they all have in common is that they represent the most exciting sights that the Philippines has to offer, places that are all really worth visiting on any journey through the Philippines. Nigel Hicks Devon-born, Nigel has lived for many years in Southeast Asia and is a frequent visitor to The Philippines. Now working as a freelance writer and photographer, his work has appeared in numerous magazines and publications around the world, and he has written and photographed a number of books about the country, including Enchanting Philippines, This is the Philippines and The Philippines, The Most Beautiful Places. He has recently been awarded a Fellowship by the British Institute of Professional Photography (BIPP).